POET, musician and songwriter Anthony O’Grady held a session and book launch in Athy library to celebrate his latest endeavour. Anthony is well known on the local music scene as he performs regularly in Clancy’s on Thursday nights and runs sessions in the Duke on a Sunday but this latest get together was to mark the publication of a book of poetry A Passion. Tony O’Grady arts exhibition with music and poetry book launch at Athy Library. Artist Tony O’Grady with his two sons Fionn and Oisín and Grainne Rynne. 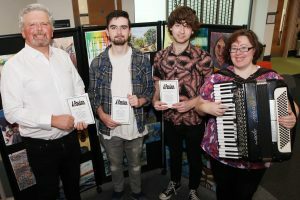 The library session was titled AMP, Art, Music and Poetry, and he was joined by a number of talented friends including Gráinne Rynne who performed on the accordion. His poetry was first published in South Africa by a friend two years ago but Anthony said he always wanted to share his work locally. The poems are about love and romance. Anthony works in the An Post parcel office and is an accomplished guitar, banjo and fiddle player. If he had to choose between music or poetry he said his passion is “on a par”. Anthony’s creativity didn’t come out of the blue as his father Dermot O’Grady was also a published author. The book costs €12 and is available on ebooks or by emailing Anthony at [email protected].